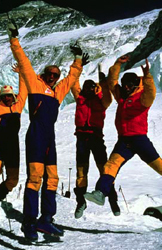 Jim Elzinga, leader of the Canadian Everest Light Expedition, celebrates with his teammates at Camp II as Sharon Wood and Dwayne Congden reach the top of the world. Sharon became the first woman from the Western Hemisphere to stand on that little patch of snow and ice. Three years of preparation, planning and training, culminating in seventy-six grueling days of high-altitude climbing in minus 40° degree temperatures and winds of over 100 miles per hour, have gone into this defining moment. Jim is one of North America's leading high-altitude climbers and the only Canadian to have led a successful expedition up an often tried but never completed route from Tibet to the summit of Mount Everest. The history-making Everest Light Expedition drew on Jim's crucial talents as a motivator, inspirational leader and master of team process, setting a new standard of success on Everest: a small team climbing a daring new route with limited resources. How his team achieved this remarkable feat and the discoveries he made as leader of the expedition are the subject of Jim Elzinga’s two inspiring keynote presentations. Both keynotes are supported by slides and video shot on location during Jim’s two Everest expeditions. The heroism Jim speaks of is not particularly his own, it is the authentic heroism of each of the members of his team who not only mastered their roles but continually found new ways to help fulfill their expedition’s vision, of pushing beyond their perceived limits, even when they knew they themselves had no chance of standing on the summit. It is a deeply engaging story of teamwork and unparalleled success, presenting a style of leadership that does not grab for the spotlight, but effectively draws almost superhuman performance from the entire team. Jim Elzinga’s story speaks directly to the Heroic Heart in each of us; drawing out a code of values and behaviors that remind everyone of what it takes for ordinary people to achieve extraordinary results. The Lessons of Everest easily translate to the world of business, revealing what it takes to be a great leader. 7. Teamwork: keep people informed, engaged, and thinking about solutions.